VELCRO appears the claims of 2077 patents, TEFLON appears om the claims of 3585 patents, ETHERNET appears in the claims of 7425 patents, and JAVA appears in 3690 patents. For examples, see U.S. Patent No. 6,959,462, Claim 2 (VELCRO); U.S. Patent No. 8,485,489, Claim 12, and 8,062,571, claim 4 (TEFLON); U.S. Patent No. 8,457,003, Claims 2, 3, U.S. Patent No. 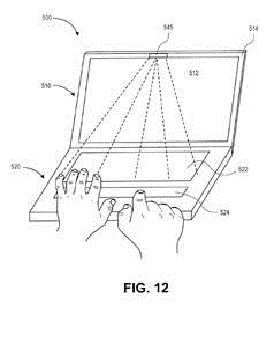 8,422,359, claim 10, and U.S. Patent No. 8,363,655, claim 5 (ETHERNET); and U.S. Patent No. 8,330,862, Claim 4, and U.S. Patent No. 8,254,757 (JAVA). 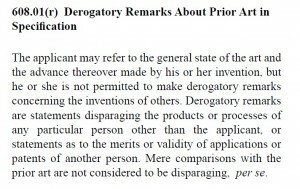 It is well established that a patentee may limit the scope of the claims by disavowal, and one of the many ways such disavowal can occur is by criticizing the prior art. 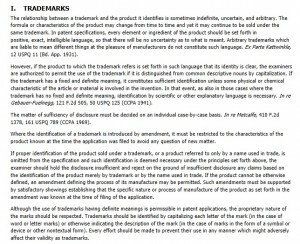 When a patent specification criticizes the prior art, it is presumed that the invention does not share the criticized featuers. Thus in Chicago Board Options Exchange, Inc., v. International Securities Exchange, LLC., (Fed. Cir. 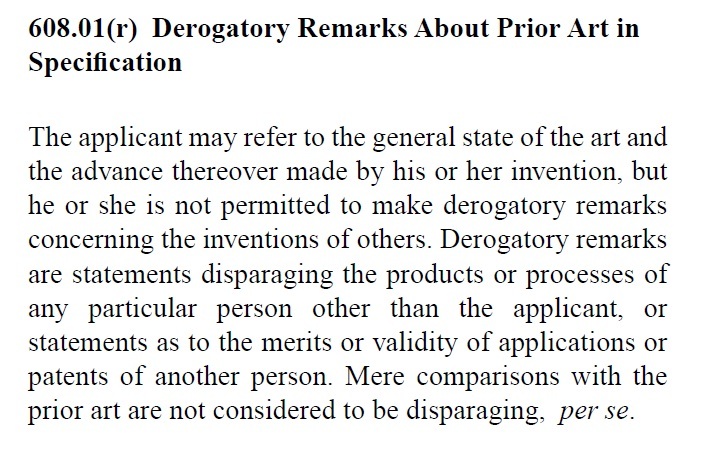 2012) the Federal Circuit affirmed the district court’s finding of disavowal noting that “the specification goes well beyond expressing the patentee’s preference for a fully automated exchange over a manual or a partially automated one, and its repeated derogatory statements about the latter reasonably may be viewed as a disavowal of that subject matter from the scope of the Patent’s claims.” Criticism of the prior art also limited the claims in In re Abbott Diabetes Care, Inc., (Fed. Cir. 2012), but this time to the applicant’s advantage. Abbott successfully argued that the broadest reasonable interpreation of its claims on appeal was at least in part limited by its criticism of the prior art. If one of these figures was copied from other, would this be copyright infringement? 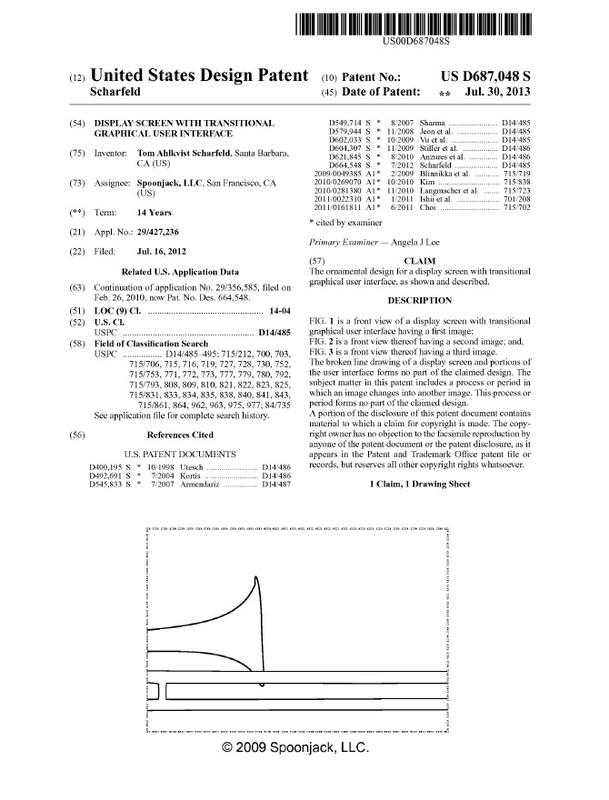 37 CFR 1.84(c) permits copyright notice on patent drawings under the condidtions. 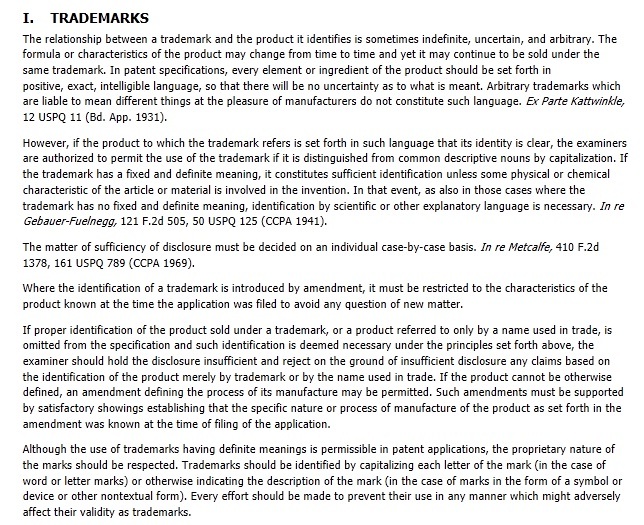 The inclusion of a copyright or mask work notice in a design or utility patent application, and thereby any patent issuing therefrom, under the conditions set forth above will serve to protect the rights of the author/inventor, as well as the public, and will serve to promote the mission and goals of the U.S. Patent and Trademark Office. Therefore, the inclusion of a copyright or mask work notice which complies with these conditions will be permitted. However, any departure from these conditions may result in a refusal to permit the desired inclusion. 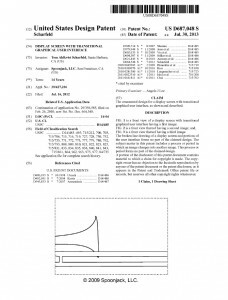 If the authorization required under condition (C) above does not include the specific language “(t)he (copyright or mask work) owner has no objection to the facsimile reproduction by anyone of the patent document or the patent disclosure, as it appears in the Patent and Trademark Office patent files or records,…” the notice will be objected to as improper by the examiner of the application. However, does the absence of copyright notice and authorization of 37 CFR 1.71(d),(e) dedicate the copyrighted material to the public? Copyright notice is not usually a prerequisite to copyright protection. The Berne Convention prohibits the imposition of formalities such as notice or registration as a prequisite to copyright protection. It would not seem that the U.S.P.T.O. could impose by implication from its regulations, a requirement of copyright notice as a prerequisite to copyright protection. Whether or not copyright notice is a prerequisite to protection, it seems like a good idea, and U.S. Patent No. 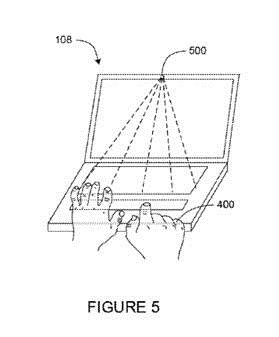 D687,048, which issued on July 30, 2013, illustrated how it can be done.